The Foster Hospital for Small Animals at the Cummings Veterinary Medical Center is located along Route 30 (Westboro Road) in North Grafton Massachusetts. Please park in the client lot directly in front of the main entrance of the Foster Hospital or in the designated parking spaces within the fenced lot adjacent to the hospital. A full parking map is available in PDF format. From the greater Boston area take the Massachusetts Turnpike (Interstate 90) west to exit 12 (Route 9, Framingham exit), located at the Sheraton Tara. Proceed west on Route 9 for 6 miles until you reach the Route 30 west exit. Follow Route 30 west under Route 9 and on into Westborough Center. Go through Westborough Center and continue on Route 30 for 4 miles. Parking for the Foster Hospital for Small Animals is off of Willard Street. From New Hampshire and Maine follow major arteries to Interstate 495 South, then to Route 9. Take Route 9 west to the Route 30, Westborough exit. Follow Route 30 under Route 9 and on into Westborough Center. Go through Westborough Center and continue on Route 30 for 4 miles. Parking for the Foster Hospital for Small Animals is off of Willard Street. From Connecticut or western Massachusetts take the Massachusetts Turnpike (Interstate 90) east to exit 11 towards Millbury/Worcester. At end of ramp, turn right on to Route 122 South towards Uxbridge. Drive approximately 1.5 miles and turn left onto Bridge Street. At the traffic light turn left onto North Main Street. At the next traffic light, bear right onto Route 30 East and travel east about 2 miles. Parking for the Foster Hospital for Small Animals and Hospital is off of Willard Street. The Cummings School is within a five-minute walk of the Grafton Station on the MBTA Framingham/Worcester Line Commuter Rail. Exit the parking lot and take a right onto Pine Street and a left onto Route 30 (Westboro Road). The Cummings School campus is just up the road. 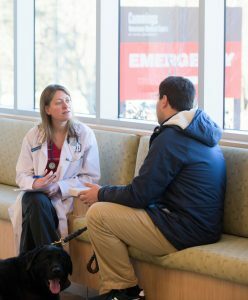 With faculty specialists in every field of animal medicine and the region's most powerful diagnostic imaging capabilities, we are able to diagnose and treat even the most difficult and complex conditions. Our veterinary specialties include MRI, ultrasound, CT and a state-of-the-art interventional radiology unit, facilitating surgical procedures such as the placement of stents and pacemakers. We also offer advanced critical care, anesthesia, pain management and advanced radiation oncology for animal cancer patients. As a teaching hospital, we are on the forefront of cutting-edge medicine, and offer clinical studies to clients who are interested in exploring such options for their pets. Beyond advanced medicine, Foster Hospital also continually strives to perfect routine procedures such as minimally invasive spaying. Although most of our caseload is dogs and cats—with over 26,000 cases a year—our specialists treat animals as diverse as pet rabbits, parrots, iguanas and fish. Behind the scenes, your pet receives the advantage of carefully orchestrated, team-based care. 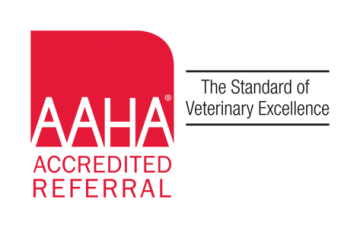 Our board-certified veterinarians, dedicated staff and students are energized to provide the very best in quality care with compassion. This is because the veterinarians at the Foster Hospital are not only highly trained specialists in their fields, they are animal lovers as well.